For the studio, see Trailer Park, Inc. For the album, see Trailer Park (album). For the television show, see Trailer Park Boys. A trailer park is a temporary or permanent area for mobile homes and travel trailers. Advantages include low cost compared to other housing, and quick and easy moving to a new area, for example when taking a job in a distant place while keeping the same home. 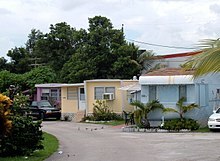 Trailer parks, especially in American culture, are stereotypically viewed as lower income housing for occupants living at or below the poverty line who have low social status and lead a desultory and deleterious lifestyle. Despite the advances in trailer home technology, the trailer park image survives as evoked by a statement from Presidential adviser James Carville who, in the course of one of the Bill Clinton White House political scandals, suggested "Drag $100 bills through trailer parks, there's no telling what you'll find," in reference to Paula Jones. It is also seen in the Canadian mockumentary Trailer Park Boys. Tornadoes and hurricanes often inflict serious damage on trailer parks, usually because the structures are not secured to the ground and their construction is significantly less able to withstand high wind forces than regular houses. However, most modern manufactured homes are built to withstand high winds, using hurricane straps and proper foundations. New Orleans in 2006 after Hurricane Katrina: A park in an unflooded part of town became the site of a FEMA trailer park for people whose homes were damaged or destroyed. 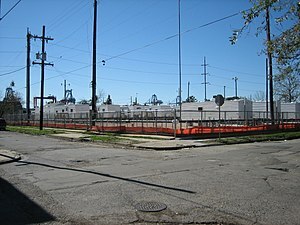 The negative perception of trailer parks was not improved by the creation of emergency trailer parks by the Federal Emergency Management Agency (FEMA) for the displaced victims of Hurricane Katrina, the quality and temporary nature of which was disputed. Many stereotypes have been developed by trailer trash regarding people who live in trailer parks, which are similar to stereotypes of the poor and the term trailer trash is often used as an adjective in the same vein as the derogatory American terms white trash or ghetto. Though trailer parks appear throughout the United States, they are often associated with the Deep South and rural areas. More recently referred to in the U.S. as "mobile home parks" or "manufactured housing communities", the stereotypes are often just that. Age-Restricted communities exist in many locales that permit mobile home parks as "55+ parks" in keeping with the Housing for Older Persons Act (HOPA). Generally at least one homeowner in these age-restricted communities must be age 55 or over and persons under the age of 18 are rarely permitted to live there. These can be gated communities with amenities such as swimming pools, clubhouses and on-site maintenance. Homes are often permanently installed on foundations. However, in certain circumstances residents may not own the land their homes occupy. Mobile home parks in the U.S. have become an attractive investment for large financial firms, such as Carlyle Group, Apollo Global Management and TPG Capital. Over 100,000 US mobile home sites were estimated to be owned by large firms in 2019. One firm, Stockbridge Capital Group, owner of about 200 mobile-home parks throughout the US "saw a return on investment of more than 30 percent between late 2016 and the end of 2017." The company's expansion into this market was facilitated by $1.3 billion in financing from Fannie Mae, which has called mobile homes "inherently affordable." Profitability for the firms owning the parks has in some cases been tied to rent increases, and has not necessarily translated into good maintenance of the mobile homes. In Europe, particularly in Germany and Spain, where trailer parks are less common (but exist) as 'normal' accommodation, disputed trailer parks exist that squat on land near urban centers (Berlin, Hamburg, Barcelona). Names for such phenomena include Wagenburg, Wagendorf or Bauwagenplatz (all German, meaning: "wagon fort", "trailer village" and "construction trailer place" respectively) and people living there are often associated with certain ethnic groups such as Romani, or with the punk movement, New age travelers, Irish travelers and a do-it-yourself punk ethic. On the whole, however, trailer parks are much less common in these countries than they are elsewhere and in United States and are much less emblematic of a distinct lifestyle and membership to a certain social class. In Germany, the Netherlands and some other European countries local law allows for normal camping at RV parks for a short time and seasonal camping for holiday makers, and also long-time camping (for years) with hardly movable travel trailers. Sometimes the inhabitants also cultivate a garden. Some cities allow a long-time camping lot to be the regular address registered with the authorities; others do not. Many of mobile home plots are offered by RV parks that allow for all sorts of camping and offer extra plots for mobile homes (static caravans).The cost for such a plot tends to be between 400 € and 1.500 € a year, depending on the location and facilities. In France, living in a trailer or mobile home for more than three months is prohibited by law, even if the resident owns the land; however, building requirements and permissions for self building of recreational solid (static) country cottages are more relaxed in France if one stays within a certain amount of square meters. In the United Kingdom, "trailers" are commonly known as static caravans, and are generally used for one of two purposes: firstly as holiday homes, designed for short-term living; and secondly as retirement homes for the elderly, designed for long-term occupancy. Both types of trailers usually enjoy good amenities and are surrounded by highly manicured gardens. In Australia, there is generally no differentiation between a trailer park and an RV park. The term "caravan park" is used to refer to both. In New Zealand, the suburb of Favona in Auckland is an area where trailer parks are concentrated. ^ Adam Cohen (1997-01-20). "Will she have her day in court?". Time. New York. Retrieved 2008-01-21. ^ a b c d e Whoriskey, Peter (February 14, 2019). "A billion-dollar empire made of mobile homes". Washington Post. Retrieved February 14, 2019. Wikimedia Commons has media related to Caravan (mobile home) sites.